Lyon Landscape Architects is built upon relationships. We value the relationships with our clients, community, design team, and the environment. Our extensive portfolio includes educational facilities, parks and recreation, sports and athletic fields, public work, master planning, residential and commercial development, and environmental and mitigation design. With offices in Kirkland, WA and Sun Valley, ID, we provide service and experience on regional, national and international levels. We work closely to maintain direct involvement and communication with our clients at all times. Our primary objectives are to ensure our projects are aesthetically pleasing, functional and are respectful of our client’s economics. Martha Shapiro and Clare Ryan have been designing gardens for over 25 years. Specializing in custom residential landscapes, they have experience in both small and large scale projects. Projects include modern and contemporary designs, as well as classically styled gardens, drought tolerant gardens, and edible gardens. Shapiro Ryan Design Philosophy Collaboration: We believe it is essential to include the homeowner in the design process. Design: Good structure creates a warm and inviting living space. We relentlessly work with layout and geometry to create graceful gardens. Style: Integration of the architecture and the site directs the design process to the appropriate response for each project. Cambium Incorporated is a full service landscape architecture, construction and maintenance firm based in Seattle, Washington. Cambium specializes in high quality, residential design, construction and landscape maintenance services. With a strong commitment to quality and customer service, Cambium has the knowledge and experience to take on any landscape project for your property. Advanced Landscape Management, Inc. is a professional company on which you can rely for all your landscape needs throughout Seattle, Snohomish and the Greater Eastside areas. Attention to detail and response to our client's needs are of primary concern to us. We are proud to have Washington Certified Nurserymen on our staff to provide you with knowledgeable and quality service and consultation. We are also proud members of the Irrigation Association and the Better Business Bureau. Our professional staff provides every aspect of landscape management and maintenance from lawn mowing, weeding, edging and fertilization services to complete landscape design, renovation, underground sprinkler systems (installation and repair), water features and landscape lighting. We take pride in having served the Greater Seattle area since 1986. Land Morphology is a Seattle-based landscape architecture practice focused on creating rich, emotive places across the United States. Founded by Richard Hartlage, Land Morphology is comprised of a talented interdisciplinary team of landscape architects, designers, urban planners, and horticulturists, who create highly varied spaces that integrate exquisite built form, sophisticated horticulture, and the fine arts. Each space is uniquely memorable, vibrant, carefully crafted, and environmentally sustainable. Land Morphology offers deep experience in designing landscapes of multiple types and scales: from customized site furnishings, like the Seibert and Rice "Birds and Bees" terracotta pots, to large, public gardens such as the Chihuly Garden and Glass and Herb and Vegetable Garden at the Brooklyn Botanical Garden. We believe that great landforms are a process to be nurtured and developed, not static spaces where design ends the day installation is complete. With vast training, knowledge, and commitment to horticulture and management, we continue to shape and cultivate each place as it matures and evolves. Using permaculture, ecological design and sustainable construction our aim is to integrate people and the landscape, creating functional and beautiful garden spaces. Our passion is to preserve the natural ecological balance in the great Pacific Northwest, to ensure a healthy regenerative living environment for generations to come. A few of the elements that are often included in the spaces we create: edible gardening (annual and perennial systems) native plants wildlife habitat – including pollinators rainwater absorption and catchment strategies artful hardscaping recycled/salvaged materials We also offer organic landscape maintenance for our clients and those who wish to transition their gardens into ecological landscapes. 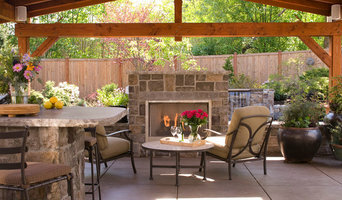 Karen Stefonick is a local, multi-talented designer, who has managed to marry her breadth of landscape knowledge with her background in interior design to create incredibly appealing outdoor living areas and gardens all over Western Washington. She has been Principal and lead Designer of Karen Stefonick Design since 1996; designing functional, quality landscape designs as small as a town house garden to 5 acre country estates. Karen has expanded her business going back to her interior beginnings; nudged into it by her loyal clients who have her designing their outdoor spaces. “Interiors often blending with and view the exterior spaces, they must visually flow and connect in order to please and delight the eye.” Her repeat business, huge referral base, published gardens and multiple awards; both national and international speaks to her success in the industry and keeps her very busy. Her professionalism and easy going attitude has developed and continues to develop relationships with many other professionals in her industry; giving her projects a level quality and client satisfaction necessary to stay competitive and successful. Karen is highly regarded as a knowledgeable and valuable resource for materials and services in the landscape design arena, and is known for incorporating environmental stewardship well before these ideas became main stream. Boutique landscape architecture and design firm. Site specific design consultations and packages, installation and project management. I create collaborative landscapes that artfully merge my client's personal style with my trained design eye. The result is a unique and highly personalized solution for every client. At Sechrist Design Associates, our design is our passion. From initial concept to final installation, we bring exceptional design skills to every project, large or small. We also bring enthusiasm, commitment, and a strong work ethic. The result? Great design and satisfied clients. At SDA, we are not just designers – we are also problem solvers. We listen carefully to our clients' needs and offer fresh and innovative solutions. We work closely with our clients to address their specific requirements regarding budget, time frame, purchasing, and installation. That's why our clients hire us over and over again: because whatever the challenge, SDA meets and exceeds their expectations. We love what we do and we bring excitement to our work. Let us put our passion to work for you! Look no further for your property enhancement needs. Hone Landscape Company is a full service design/build contractor with extensive experience in all areas of property works. 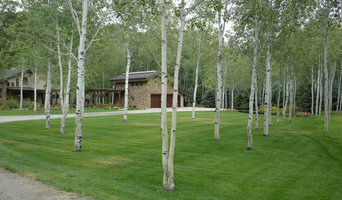 Exceptional landscaping is only one of our specialties. We also specialize in retaining walls, drainage solutions, water line and utility trenching/replacement/install, hillside stabilization, native plantings, outdoor living spaces, water features and more. In fact many of our customers find themselves saving substantial money having one company take care of all their property needs. We’re experienced in all the services we provide and pay attention to detail with each separate task. We aim to please! Examples of our service are outlined throughout this website. If you have questions about anything you do or don’t see here just contact us and we'll be happy to respond. Thanks for browsing and look forward to working with you! 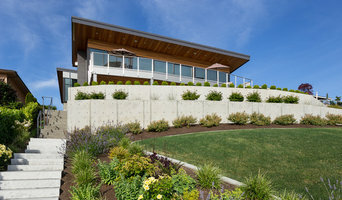 Founded in 1988 by Ken Philp, Kenneth Philp Landscape Architects has grown to become a 5-person firm specializing in residential, urban, public and commercial design throughout the Pacifc Northwest. KPLA's design process emphasizes three equally important and fundamental aspects of design: architectural style, inherent qualities of the site, and our clients’ personality and vision. We believe it is imperative to consider each of these factors, allowing each aspect to shape the design process and create a springboard for our composition of a concept and program. We have employ a diverse team of Landscape Architects, project managers and support staff, and make our clients needs our first priority. Throughout the progression of a project, each site and situation generates ideas that are unique to itself. Our process-oriented design approach is flexible and adaptable, allowing us to fully address the complexities and opportunities of individual projects and respond in kind. With this tailored process and over 75 combined years of professional experience in planning, design, sensitive areas work, permitting, project management, and construction administration services, we are able to create spaces that distinctively express architecture, site, and the client. Call or email today to discuss designing your landscape project of any scale. Landscape Architecture, Design, Consulting, Drafting, Project Management at a reasonable rate. 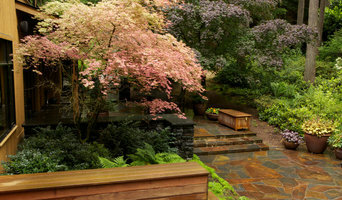 Emily Russell, the owner and principal of Russell Design Source is a member of the American Society of Landscape Architects and licensed in Washington State (#1272). Expertise covers all aspects of Landscape Architecture from residential and campus design, urban planning to parks, public art, commercial spaces, and planned communities. 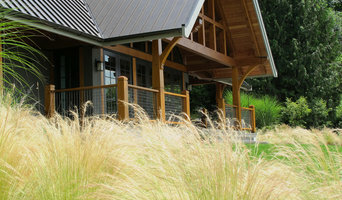 We are a full service landscape architecture firm based in the Pacific Northwest that specializes in sustainable, low maintenance, and timeless residential and commercial projects.